We're referring to times of the past when a competition later became the famous outmost Regatta to compete in, alias the America's Cup. It was in the year 1851 when the "100 guineas Cup" was organized for the first time and set during London's worldwide exhibition. The challenge was open to every nation and cast by the Royal Yacht Squadron. It foresaw the circumnavigation of the Isle of White, off the South coast of England. The fastest English vessels at the time rose to the bait, in total, seven schooners and eight cutters duelled against one another and one foreign boat. The foreign innovative yacht came across the ocean from America with John Cox Stevens at the helm. "America" won a few minutes ahead of the English fleet and brought the trophy to the United States. As of then the regatta became known as the America's Cup and the trophy has never returned since to England. Years go by and we're now in 1929 when by then American and English yachts battle in the seas off New York with magnificent vessels in compliance to the agreed tonnage. At the outcome of a conference held in Paris in 1907, the agreement was to adopt the International Gauge parameters translated into "Metric Class" which, at the end of the war, became the universally approved "J Class" with its rulings that foresaw: an L.o.a. 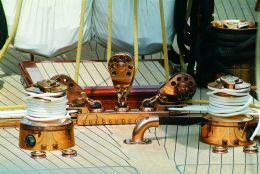 in from 73 to 87 feet, a Marconi sail rig, a maximum tonnage between 150 and 160 tons and a sail area of 700 sq. metres upheld by a 46 metre mast. In short, in 1929 Sir Thomas Lipton, owner of the homonymous tea brand, decides for the fifth time to be the challenger of the America' Cup under the vestige of the Royal Ulster Yacht Club in northern Ireland. "Shamrok V" is hence built by the British to contrast the Americans' superiority who will field 5 J class yachts. 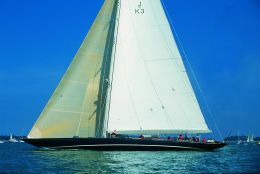 "Shamrock V" was designed by Charles Nicholson and built by Camper & Nicholson shipyard in Gosport, Hampshire. 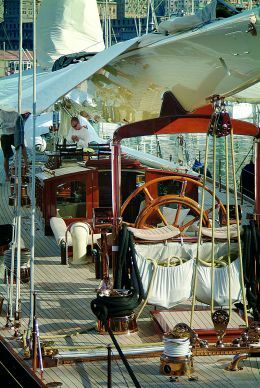 Built with a steel ribbing covered with mahogany wood plies she is still today the only J class afloat with the same structure. The original mast, before the last refitting, was hollow in spruce fir wood. Prior to crossing the Atlantic for the challenge, she had already won, covering over 700 nautical miles, 15 of the 22 regattas she had participated in. In the 1930 edition of the America's Cup, regattas were held in Newport, where the New York Yacht Club took up its summer residence. 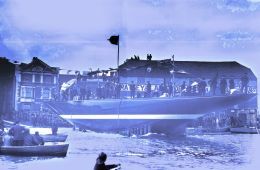 "Enterprise" won the races as defender of the club hosting the challenge thanks to the superior modern solutions she had practiced defeating Sir Lipton's attempt to bring the cup home. Sir Lipton died a year later. "Shamrock" was later bought by Thomas O.M. Sopwith a renown sailor who was, moreover, an aeronautical industrialist who raced her in many regattas in the south of England. In forthcoming years all the J classes were decommissioned, sunk or abandoned but "Shamrock V," as by magic, continued to sail. After World War two Shamrock changed hands again and became the property of an Italian gentleman called Mario Crespi who sold her, as a family yacht, in 1962 to Pietro Scanu. In 1967 Mr. Scanu decided to restore her at Camper & Nicholson's shipyard where the teak deck was replaced, the hull's metal parts were sanded down, new engines and systems were fitted and work was done also on the wooden areas and rigging. At about the same time, Camper & Nicholson sold the yard to Southampton Yacht Service who renamed the main jetty in Shamrock's honour. In 1986 the Lipton Tea Company purchased the yacht and gave it to the Newport Yachting Museum in Rhode Island. In 1989, thanks to Elizabeth Meyer's precious contribution, she was restored again. 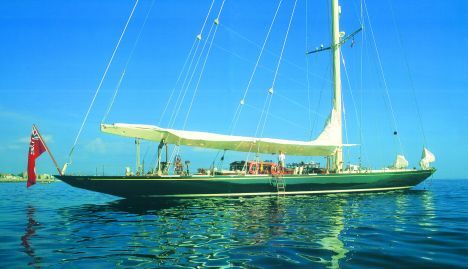 Her last refitting, including adjusting her ballast and sailing equipment, was carried out by her latest owners in between 1999 and 2001 at Pendennis' shipyards in Cornwall. The latest work aimed at improving its performance and making it more comfortable for guests to enjoy its sailing history. 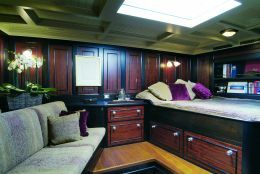 Shamrock V, today hosts 8 guests in 4 cabins two of which have double berths and 2 with separate berths. The woodworks still preserve some of the original panelling as well as other details dating back to Mr. Crespi's restoration period. 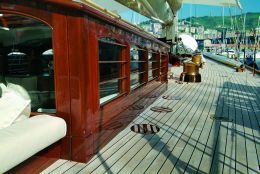 The deck has been completely refurbished in teak and the sailing equipment is brass coloured. The aluminium mast with four cross trees and boom are made by Rondal Masts of Holland. The stays are Nitronic-50 in Kevlar by Navtec. In fact the mast as the stays and shrouds were specially designed for "Shamrock V" by Navtec. With new sails made by Doyle she can now sail at 11 knots. Under engine she is powered by two 205 HP Caterpillar diesel engines with a range of 800 nm at 9 knots thanks to her 4000 litre fuel tank and 6000 litre water tanks. Electricity is supplied by a 26 Kw generator. Shamrock V's base is in the Mediterranean and offers her clients exclusive charters in its most fascinating waters. For further information: Yachting Partners International, 28/29 Richmond Place Brighton, East Sussex BN2 9NA England, Tel. 0044 (0) 1273 571722 - French Office Tel. 0033 (0) 4 93340100.